Feeling stressed about money? You’re not the only one. According to the American Psychological Association, money is the number one case of stress for Americans, with 67 percent of people ‘fessing up that they’re stressed about their finances and, according to a 2016 study from Northwestern Mutual Life Insurance, more than a quarter of you worry about money every single day. This is no way to live. Sure, paying the bills is stressful, but we’ve got some awesome ways to conquer the tension. Our society sends the message that talk of money should be quiet, but there are plenty of professionals who can help. A fiduciary financial professional can work in your best interest (find a financial planner here or a financial counselor or coach here). Or, if you suspect that the problems are more complex, and if you think your financial issues intertwine with emotions, insecurities, past experiences, or relationship conflicts, consider speaking with a financial therapist, says Megan Ford, a financial therapist at the University of Georgia and the president of the Financial Therapy Association. 2. OPEN SAVINGS ACCOUNTS (PLURAL). You should have a minimum of two savings accounts, says Mary Bell Carlson, principal at Silverbell Solutions, LLC, a financial counseling and consulting firm. One should be your emergency fund, and you should strive to have three to six months of living expenses in this one, Carlson says. Next, she recommends that clients have a life fund, which is a savings account for the things that are always due: insurance premiums, quarterly water bills, car maintenance, personal property taxes, and others. “This account is attached to your checking account, and allows you to transfer the funds when the bills come due, but it helps you save for these expenses throughout the year,” she says. 3. NOTICE WHEN YOUR STRESS PEAKS. 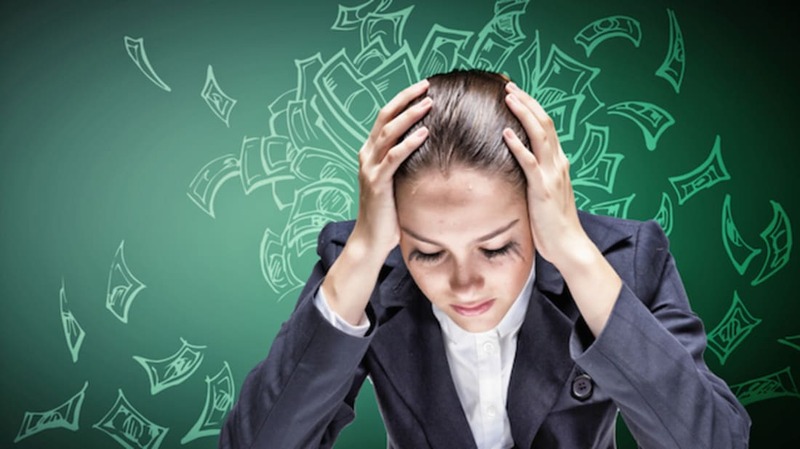 You may feel like you’re always stressed about money, but start to pay attention to when your stress is the strongest, says Anne Malec, a financial therapist in Chicago at Symmetry Counseling. For example, if your money stress is at its peak when a stack of bills is sitting on the counter or in your email inbox, commit to making a habit of opening bills as they arrive, and keep a running tally of what will be owed at the end of the month, or decide to pay specific bills before the last day of the month, she says. “The goal is to maintain awareness of monthly debts so that you are not overwhelmed by their totality at month’s end,” Malec says. The point is that if you can figure out when exactly the money stress is hitting you, then you can figure out how to combat it. "Try to see the stress as a warning sign that your finances need more attention," Malec says. Small, manageable goals are easier to achieve than long-shot goals, Malec says. “If you feel you are behind in saving for retirement, and this causes you stress, commit to change to get serious about savings, which will mean reducing your spending or increasing your income or both,” she says. First, spend time on your budget to determine where you can cut, and get creative. Bring your lunch to work, cut back on Uber trips, put your health club membership on hold, cut back on restaurants. “It will be an adjustment, but your future self will be grateful,” Malec says. A lot of financial stress is caused by simply not knowing where your money is going, Carlson says. “I call this the ostrich with its head in the sand syndrome,” she says. “Somehow, we think that if we ignore the financial problem, it will simply go away.” Carlson encourages clients to estimate their income and expenses before the month starts, then track their spending throughout the month to see how realistic their estimates were. “This helps the client know where their money is going, and helps them make active and engaged decisions on what changes need to be made,” Carlson says.